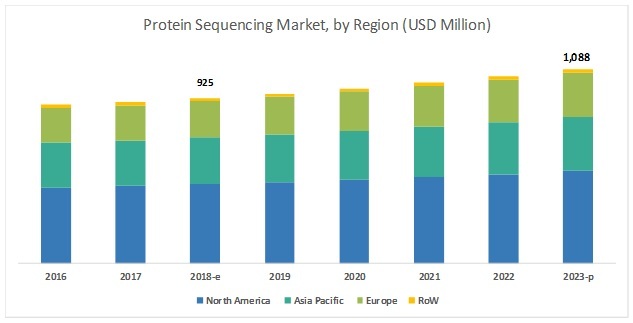 [118 Pages Report] The global protein sequencing market is projected to reach USD 1,088 million by 2023 from USD 925 million in 2018, at a CAGR of 3.3% during the forecast period.The study involved four major activities to estimate the current market size for protein sequencing. Exhaustive secondary research was done to collect information on the market and its different subsegments. The next step was to validate these findings, assumptions, and sizing with industry experts across the value chain through primary research. Both top-down and bottom-up approaches were employed to estimate the complete market size. Thereafter, market breakdown and data triangulation were used to estimate the market size of segments and subsegments. The protein sequencing market comprises several stakeholders such as protein sequencing equipment manufacturers, vendors, and distributors; protein sequencing service companies; protein sequencing bioinformatics/data analysis companies; research laboratories and academic institutes; venture capitalists and other government funding organizations; research and consulting firms; pharmaceutical and biotechnology companies; contract manufacturing organizations (CMOs); and contract research organizations (CROs). After arriving at the overall market size using the market size estimation processes as explained above the market was split into several segments and subsegments. In order to complete the overall market engineering process and arrive at the exact statistics of each market segment and subsegment, the data triangulation and market breakdown procedures were employed, wherever applicable. The data was triangulated by studying various factors and trends from both the demand and supply sides in the protein sequencing industry. Micromarkets are defined as the further segments and subsegments of the protein sequencing market included in the report. 2. Core competencies of the companies are captured in terms of their key developments and key strategies adopted to maintain their position in the market. The protein sequencing market is projected to grow from an estimated USD 925 million in 2018 to USD 1,088 million by 2023, at a CAGR of 3.3% during the forecast period. Growth in the protein sequencing market is mainly driven by the increasing focus on target-based drug development by pharmaceutical and biotechnology companies, advancements in clinical mass spectrometry and analytical techniques, and increasing public-private financial support for proteomic research. Growth in the protein sequencing services segment can be attributed to factors such as the launch of technologically advanced instruments, software, and services for protein sequencing; the high cost of sequencing infrastructure; complexities associated with protein sequencing procedures; and the availability of cutting-edge sequencing infrastructure among service providers. The large share of the mass spectrometry segment can be attributed to its advantages, such as high-throughput sequencing capabilities, cost efficiency, and identification of blocked or modified proteins. Market growth is also due to the increasing focus of market players on launching technologically advanced mass spectrometry instruments and increasing application of mass spectrometry in proteomics research. The increase in funding for proteomic research by public and private institutes is a major factor driving the growth of the academic institutes and research centers segment. Academic institutes and research centers use protein sequencing for proteomic research. These facilities rely on protein sequencing providers to carry out proteomic research due to lack of infrastructure, a limited number of samples, and budget constraints to procure protein sequencing consumables. Also, various academic institutes and research centers provide various protein sequencing services, such as mass spectrometry and Edman degradation. North America is one of the major revenue-generating regions in the protein sequencing market. The large share of this regional segment can mainly be attributed to the availability of funds from public and private organizations for carrying out proteomic research, growing focus on structure-based drug design, the presence of leading protein sequencing stakeholders, and the increasing number of drug development activities in the region. Thermo Fisher Scientific (US), SGS S.A. (Switzerland), and Shimadzu (Japan) are the major players operating in the protein sequencing market. Other players in this market include Waters Corporation (US), Rapid Novor (Canada), Agilent Technologies (US), Charles River Laboratories (US), and Selvita (Poland). Thermo Fisher Scientific has a strong global presence with more than 48% of its revenue generated from the US and around 9% from China. It led the market with its flagship mass spectrometry platforms Q Exactive UHMR Hybrid Quadrupole - Orbitrap (launched in June 2018), Thermo Scientific TSQ 9000 Triple Quadrupole GC-MS/MS system (launched in April 2018), and Orbitrap Fusion Lumos Tribrid Mass Spectrometer (launched in June 2017). The company also provides reagents and consumables for protein sequencing. The company’s growth in consumables sales also contributed to maintaining its position in the protein sequencing market. SGS S.A. is a leading provider of protein sequencing services. The company adopted acquisitions as a key inorganic growth strategy to expand its geographic coverage and enhance its service capabilities. The company utilizes its subsidiary’s technologies and resources to provide advanced services, including protein sequencing solutions, to its customers across the globe. This strategy helps the company to enhance its innovative protein sequencing service offerings. In June 2018, Shimadzu (Japan) launched the Quadrupole time-of-flight (Q-TOF) LCMS-9030 System. This helped the company to expand its product offerings. In January 2018, SGS S.A. (Switzerland) acquired Vanguard Sciences Inc. (US), a food safety testing service provider. This helped the company to improve its protein sequencing offering for food safety. In March 2018, Charles River Laboratories (US) started its Biologics Testing Solutions facility in Pennsylvania (US) to support the characterization, development, and release of biologics & biosimilars. What are the growth opportunities related to protein sequencing across major regions in the future? Emerging countries have immense opportunities for the growth and adoption of protein sequencing products and services. Will this scenario continue in the next five years? What are the various applications where protein sequencing finds a high adoption rate? What are the new trends and advancements in the protein sequencing market?